Concrete house plans that provide great value and protection. Gone are the days of the typical bunker-style concrete homes. 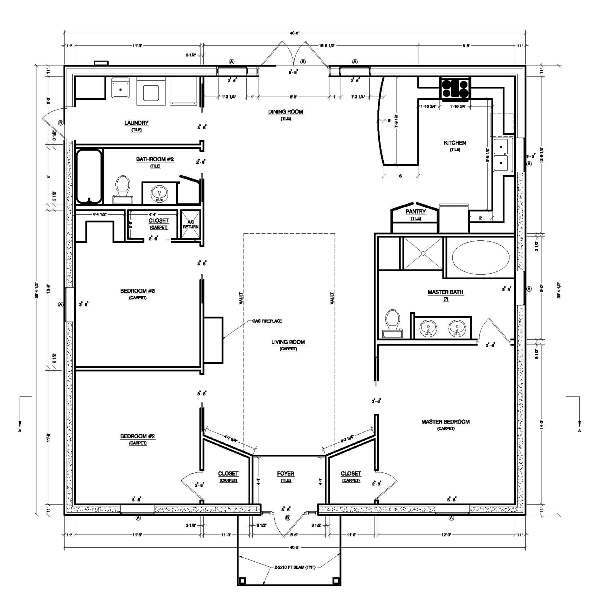 Concrete house plans today can be designed in any style that you would like. And the added advantage is that you get a super-sturdy, energy efficient, insect-resistant home that will last many, many generations. Concrete homes can be built with either concrete blocks or solid poured concrete as ICF walls (insulating concrete forms--our preference). Concrete block house plans are more common, but ICF building has become more and more popular as consumers are learning about its advantages. Fears of extreme weather such as hurricanes and tornadoes, and rising energy costs are sending many homeowners looking for viable solutions to not only protect themselves and their families, but also keep their energy costs down. View exclusive photos of a concrete (ICF) home under construction. ICF blocks are forms that are made of high-density foam, which are then filled with concrete and steel reinforcement. This creates a super-insulated thermal "sandwich" that is airtight, quiet, and resists fire and strong winds. 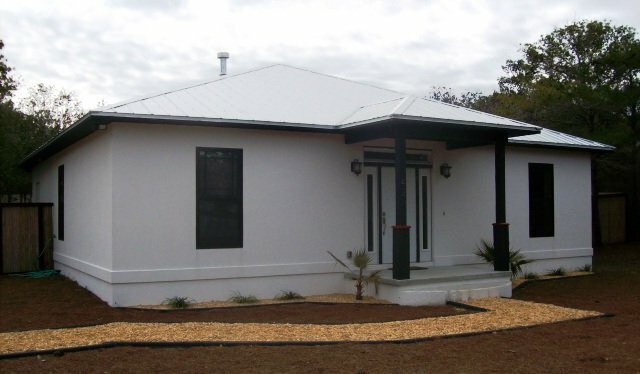 As compared to block house plans, ICF houses actually provide an added advantage in that the walls are solid AND the ICF walls have a layer of foam on the outer and inner walls for incredible energy efficiency. 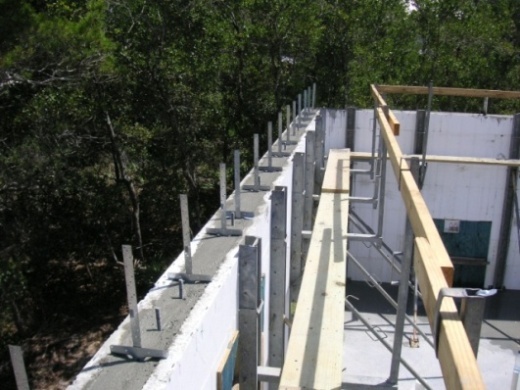 ICF actually provides more design flexibility than concrete block houses, too. Learn more about ICF house plans. When choosing concrete house plans, consider the fact that single-story plans will be cheaper to build than two (or more) stories. Foundations for concrete houses typically are concrete slab, which provides a better support for the extra weight of the concrete walls. Beyond that, concrete houses need not be restricted by anything else. A concrete home can be designed to look like any traditional home. You can use any type of exterior finishing materials on a concrete home that you can use on any other type of home. Stucco is commonly used, but you can also use any type of siding. Following is one of our listed designers' concrete house plans that uses ICF exterior walls. A photo of one of these walls during construction appears below. Note how thick these ICF walls are--about a foot thick! Compare that to walls in traditional "stick" construction, which are only 4 or 6 inches thick. Homeowners who choose this plan can also expect to save roughly 50% on their insurance and energy costs. Want to learn more about ICF homes? Want to learn about how ICF homes stand up to hurricanes? 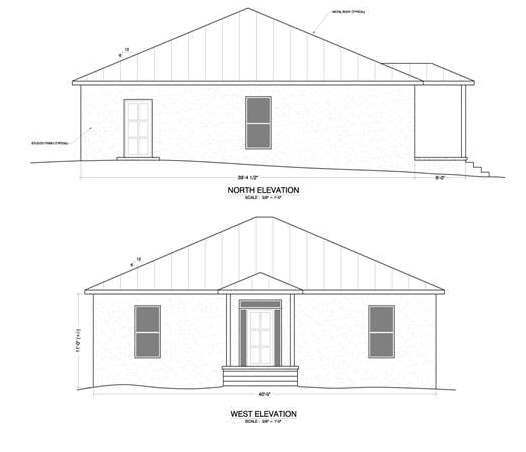 Or are you interested in learning about hurricane proof house plans? Want to learn about how ICF homes stand up to tornadoes? If you'd like to see more photos of the Seabreeze house (including while it was under construction), click here. Contact the designer if you'd like to learn more about this plan, or purchase the plan. Return to the House Plans Catalog page from Concrete House Plans. Return from Concrete House Plans to the Home Page.